Land Rover has joined forces with the Mobile Malaria Project, winners of the 2018 Land Rover Bursary in partnership with the Royal Geographical Society to embark on an eight-week adventure. The trip will comprise of three Oxford University researchers, led by Dr George Busby, and will take in Namibia, Zambia, Tanzania and Kenya. They will cross more than 6,300 kilometers (3,914 miles) in a specially-modified Land Rover Discovery to investigate the challenges facing those on the front line of malaria control in Africa. "We are humbled that Land Rover and the Royal Geographical Society (with IBG) have chosen our project as the 2018 bursary winner," said Dr George Busby, Mobile Malaria Project Expedition Leader. "Although global malaria rates have halved over the past 20 years, progress more recently has stalled. By working with colleagues in Namibia, Zambia, Tanzania and Kenya, our journey will help us to understand the challenges facing malaria researchers in Africa in 2019." "The loan of the Discovery not only gives us the capability we need to visit locations we might not have been able to reach otherwise, it gives us the space and versatility to transport the equipment we need. This will allow us to gain a better understanding of how this technology could be used to answer locally relevant questions about malaria parasites and the mosquitoes that transmit them." The car has been designed and developed by the Land Rover Special Vehicle Operations skunkworks, and is equipped with a mobile genetic sequencing laboratory that includes a fridge/freezer unit to safely store scientific supplies, a bespoke load space configuration frame system with specially-designed storage equipment cases, and an on-board expedition battery. The unique modifications will allow the research team to trial portable DNA sequencing technology, in collaboration with African research centers, to better understand how the technology can be used in different locations. On the exterior of the vehicle there is a purpose-built dual sun awning, rescue equipment, a winch, sand/mud tracks, expedition roof rack and LED night driving lamps. "Malaria is a global issue which impacts millions of people worldwide. At Jaguar Land Rover we are passionate about using our technology to empower talent and enable experts in their field to make a real difference in our world," said Dr Steve Iley, Chief Medical Officer, Jaguar Land Rover. 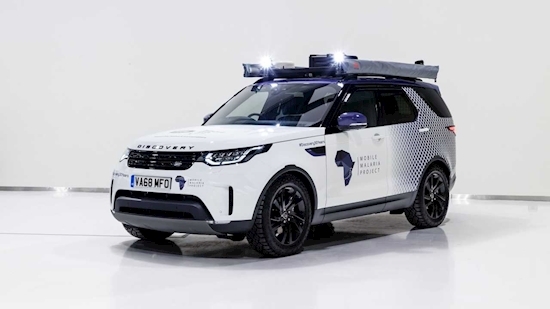 "Through the bespoke technology developed by our Special Vehicle Operations team, this project has the potential to deliver a real insight into malaria control globally and I am proud that Land Rover can be a part of that journey." Land Rover is working with the Mobile Malaria Project, winners of the 2018 Land Rover Bursary in partnership with the Royal Geographical Society (with IBG), as it heads to sub-Saharan Africa to embark on a unique eight-week journey of Discovery. Land Rover has been engineering vehicles capable of tackling the toughest terrain around the world for more than 70 years. Now it is working with the Mobile Malaria Project, winners of the 2018 Land Rover Bursary in partnership with the Royal Geographical Society (with IBG), as it heads to sub-Saharan Africa to embark on a unique eight-week journey of Discovery. Made up of three Oxford University researchers, led by Dr George Busby, the Mobile Malaria Project will travel more than 6,300km across Namibia, Zambia, Tanzania and Kenya. Driving a specially-modified Land Rover Discovery, they will investigate the challenges facing those on the front line of malaria control in Africa – where 90 per cent of the world’s cases occur. Designed and developed by Land Rover Special Vehicle Operations, the Discovery is equipped with a mobile genetic sequencing laboratory that makes full-use of the vehicle’s 1,137-litre load space. Not only does it feature a fridge/freezer unit to safely store scientific supplies, there is also a bespoke load space configuration frame system with specially-designed storage equipment cases and an on-board expedition battery. The exterior comes with bespoke additions too, including a purpose-built dual sun awning, rescue equipment, a winch, sand/mud tracks, expedition roof rack and LED night driving lamps. These modifications will allow the team to trial portable DNA sequencing technology, in collaboration with African research centres, to better understand how the technology can be used in different locations. This will provide important information about malaria parasite and mosquito populations, including drug and insecticide resistance. The Land Rover Discovery has a 30-year track record of tackling the most difficult terrain, reaching threatened habitats and vulnerable people across the world. Equipped with the latest all-terrain capability technology, the vehicle will allow the team to travel with confidence – no matter the conditions they face. The expedition group has also teamed up with another of Land Rover’s global humanitarian partners, what3words, to accurately plan their route, navigate on the ground and document their findings in real-time.